Two University of Georgia Extension Specialists in the Department of Horticulture have been selected to receive Extension Innovation Grants. These grants are established to promote unique and innovative Extension research for projects that need seed funding to get them started, or have a very specific focus that may not be covered under other outside granting agencies. Dr. Cain Hickey, Extension Viticulture Specialist’s project is titled “Establishment of a Chardonel and Chambourcin vineyard for performance of own-roots and rootstocks in a region conducive to Pierce’s disease infection and vine death.” Dr. Bodie Pennisi’s project is titled “Putting the P’s in IPM: Integrated Pest and Pollinator Management Hands-on.” Well done colleagues! Posted in Alumni, Outstanding Research. Posted in Alumni, Floriculture/Greenhouse, Landscape, Uncategorized. 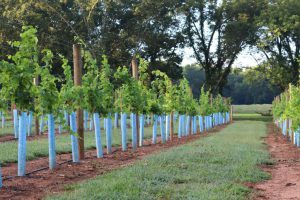 The Southeastern Regional New Grape Grower’s Conference will be held in Athens, GA on December 11, and again in Asheville, NC on December 12. The Southeastern Regional New Grape Grower’s Conference is a collaborative effort between the University of Georgia, Virginia Tech, and North Carolina State University. Personnel from those universities and industry members from the Georgia and North Carolina will give presentations at both locations. The conference is intended to provide prospective and new vineyard and winery owners with basic considerations for starting up vineyards and wineries and to introduce the fundamentals of grape growing. For those blog subscribers who already have a vineyard – please make potentially interested parties aware of this conference by sharing this link. Thanks in advance. Posted in Landscape, Nursery Production, Outstanding Research, UGA Horticulture. We are very happy to announce that our very own Ruqayah Bhuiyan has been chosen to receive the National Proven Winners Grower Excellence Scholarship!!! This $5,000 scholarship is extremely competitive and was established by the Proven Winners Corporation to recognize the very best students in the floriculture industry! Ruqayah is the third UGA Hort Dept Student to receive this award over the last ten years! Well done Ruqayah! Many thanks to the Proven Winners Team for supporting our industry’s young professionals! Hort Dawgs bring it home!! !